The House of Dun lies on land that rises gently on the north side of the A935 Montrose to Brechin road a little under three miles west of Montrose. It looks south over the west end of the Montrose Basin, a huge tidal basin that comes close to turning Montrose into an island. Surrounded by parkland and complete with a walled garden to its east, the House of Dun is for many the perfect Georgian country house. The story of the House of Dun starts some 350 years before it was actually built. In 1375 Sir Robert Erskine from Renfrewshire purchased the Dun estate and he or one of his early descendents built a tower house on a spot about a quarter of a mile west of the current house. This continued to be the Erskine family home until the early years of the 1700s when David Erskine, the 13th Laird of Dun, and a wealthy lawyer, decided he needed something more comfortable and prestigious. 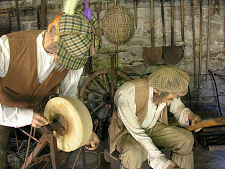 By the 1600s it was increasingly common for Scotland's many noble or landed families to begin to feel that their ancestral castles no longer met their needs or aspirations. They responded in many different ways. In some cases castles evolved outwards into something larger and more comfortable. In other cases the family simply built a grand house and abandoned the old castle, leaving it to become a picturesque garden ornament. David Erskine took a bolder approach. He pulled down Dun Castle some time before 1723, then turned his attention to the house he wanted to replace it with. The story of the design and building of the House of Dun was a protracted one, and involved a number of notable players with, by some counts, no fewer than five different designs being produced. 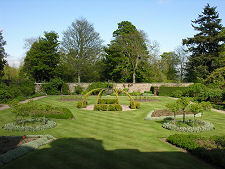 Erskine first commissioned the official Edinburgh City Architect, Alexander MacGill, to find the ideal location within the estate for a new house and produce plans for it. He also consulted his kinsman, John Erskine, 23rd Earl of Mar, on the design: a process made no easier by the latter's exile in France following his leading role in the 1715 Jacobite uprising. 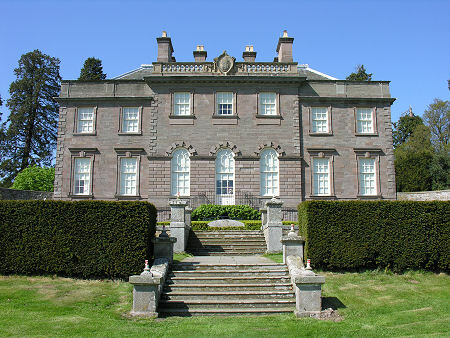 Later in the process Erskine turned for a fresh design to the notable Scottish architect William Adam, though with continuing input from Mar. Work finally began on the House of Dun in 1730, based on William Adam's design, which he loosely based on the Chateau d'Issy near Paris. The design of the house continued to evolve as it was built, with additional ornamentation being incorporated at the suggestion of the Earl of Mar. What William Adam though of the continuous changes of mind by his client and interference by the Earl of Mar is unrecorded: perhaps it was simply par for the course when dealing with the sort of wealthy clients he was well used to working for. The House of Dun took some 13 years to build, with the work on the magnificent plasterwork in the saloon not being completed until 1743. 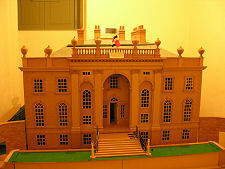 What emerged is widely regarded as the finest medium-sized country house to have been built by William Adam. 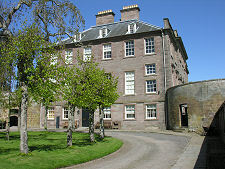 Successive generations of Erskines lived at the House of Dun until 1947. In that year the estate was inherited by Millicent Lovett, née Erskine, who became the 21st and last Laird of Dun. In response to post war austerity she chose to live in a more modest house on the estate, and leased the House of Dun itself to be run as a country house hotel. Mrs Lovett died in 1980, and bequeathed the House of Dun, together with its contents and estate, to the National Trust for Scotland. 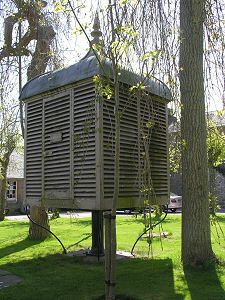 When the House of Dun ceased to function as a hotel in 1985, the NTS launched an appeal for the funds needed to restore it to its earlier life as a family home. 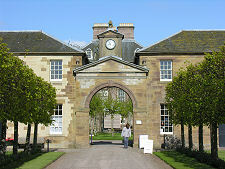 The restored house was officially opened by the late Queen Mother on 12 May 1989. The approach to the House of Dun is from the A935. From here a drive passes the west side of the house en route to the visitors' car park, which lies to its north west. The path to the front - or north side - of the house leads you past a magnificent line of Wellingtonia trees. The front door is reached up a broad flight of stone steps that actually form a bridge over a passage along the front of the basement level of the house. Your first glimpse of the interior comes with the main entrance hall, which forms the focus of the ground floor. From here visitors take a tour that includes a surprisingly large proportion of the house, including all of the first floor. At ground floor level, the most important rooms line up along the south face of the house, from where they enjoy magnificent views over the Montrose Basin. 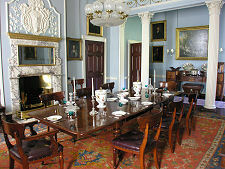 The south east corner of the ground floor is occupied by the dining room. Originally designed by William Adam as a drawing room, this was extended in the 1800s, with the removed wall which originally separated it from a state bedroom being replaced by fluted columns. Next in line is the most important room in the house, the saloon. 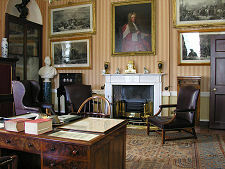 This was the principal place of entertainment in the house, both in Adam's original design and subsequently. The saloon's most striking feature is its incredibly ornate plasterwork. This has been restored as it would have appeared when the house was completed in 1742. 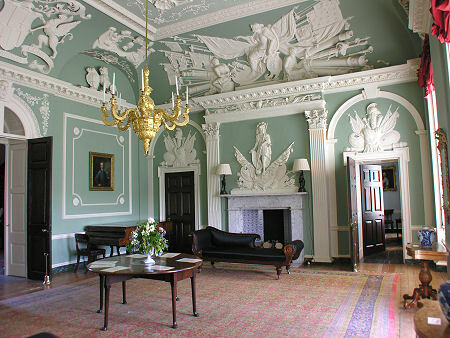 The plasterwork was originally the work of Joseph Enzer, a man who had made a name for himself with decorative plasterwork in a number of grand Scottish houses. He was paid £216 for his work at the House of Dun. The third main room on the ground floor is the library. The room only assumed this role in the 1800s. In Adam's original design this would have been a bedroom, with the library placed in the centre of the south face of the first floor of the house. The new library is therefore restored as it would have been used by the Erskines at the end of the 1800s. 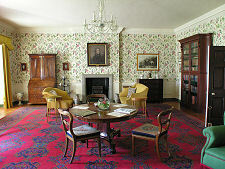 Off the library is the parlour, one of the family's suite of private rooms in Adam's original design. 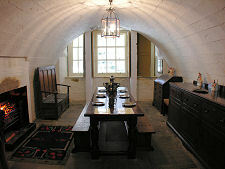 This connects to the charter room, intended to house the family's valuable documents in safety. The first floor is divided into two halves, separated by the old library and the first floor landing. 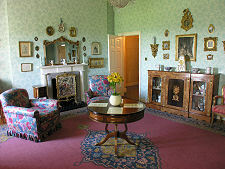 When the house was restored in the 1980s, a number of later partitions were removed from the old library and the room was furnished as a country house sitting room. The rest of the first floor comprises two sets of interconnecting rooms. 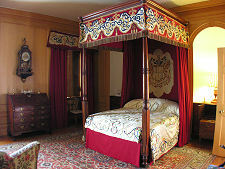 These include a number of fascinating bedrooms, most notably the red bedroom complete with a magnificent four-poster bed which was given by William IV as a wedding present to his daughter, Augusta. 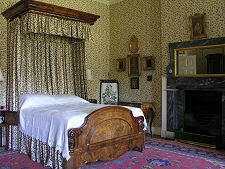 Some of the smaller rooms contain fascinating details. 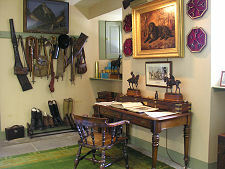 Mrs Erskine's dressing room comes complete with a boot-bath from the 1800s. This rather frightening object is shaped like an elongated boot and the bather has to bathe almost entirely enclosed within it. How you are meant to get out at the end of the bath is unclear. 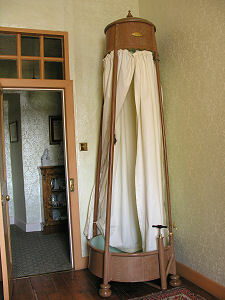 Even more remarkable is the shower bath manufactured by Sibbald and Sons in the 1800s and found in the red dressing room. The tank at the top had to be manually filled by a servant, and as the water drained down into the tank at the bottom a servant had to hand pump it back up to the upper tank. 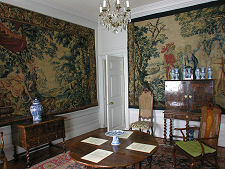 Elsewhere on the first floor is the tapestry room, now home to two huge Belgian tapestries; and the boudoir, referred to in the 1850s as Mrs Erskine's sitting room. In the basement of the house you find an extensive series of rooms that gives an insight into the "below stairs" lives of the servants who kept the house functioning. 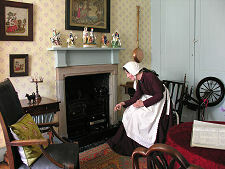 These include, at the west end of the house, the kitchen and, opposite it, the housekeeper's sitting and bedroom. 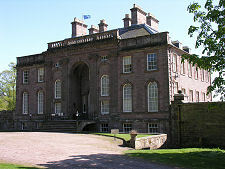 The centre front of the basement is occupied by the laigh hall, currently furnished as a servants' hall as planned by William Adam. 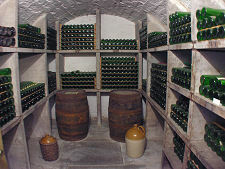 Nearby are the china pantry and wine cellar, plus two rooms seldom seen in historic houses, a gun room and a rod room, reflecting the estate's sporting heritage. 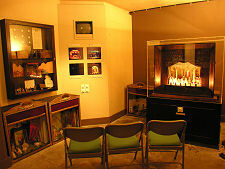 At the east end of the basement is a room housing a collection of model theatres, while nearby is another containing an impressive model of the House of Dun itself. A visit to the House of Dun is about more than just the house itself. To the east of the house is a rectangular walled garden, and there are more gardens to the south, separated from the surrounding countryside by a ha-ha, a vertical drop intended to allow open views in, but keep sheep out. All of this has been returned to a form that would have been familiar to the house's first residents in the 1740s. To the west of the house is a service courtyard, once home to the carriage houses and stables. 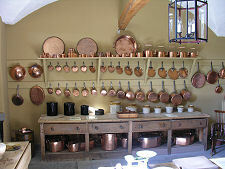 Here you find the shop and tearoom, plus a number of restored rooms. In the centre is an impressive game larder. Beyond the confines of the house and gardens, the wider estate offers a number of longer walks.